Issa Rae and Marsai Martin in LITTLE. Courtesy of Universal Pictures. A body-swap comedy about an overly demanding diva who wakes up in the body of her younger self, starring three insightful, comedic powerhouses like Regina Hall, Issa Rae and Marsai Martin should be a slam dunk. Add in nuanced direction by Tina Gordon (PEEPLES) and a bright script co-written by Tracy Oliver (GIRLS TRIP) generated off a clever pitch by Martin, and success should be assured. Unfortunately, in the case of LITTLE, all these elements fail to gel into the effervescent, funny feature the premise suggests. While it distinguishes itself from other films about regression as progression (NEVER BEEN KISSED and 17 AGAIN come to mind) with its heartening platitudes on sisterhood, black girl magic and “glowing up,” it doesn’t lean into the outrageousness of the situation nearly enough. Mogul Jordan Sanders (Regina Hall) has it all – well, except for a nice personality. In her teens, she was bullied by a mean girl (Eva Carlton) and walked away from the experience bitter, vengeful and having learned all the wrong lessons. She’s become what she hated: a raging, rude monster, exasperated at everyone’s ineptitude. Her bad attitude has seeped into every corner of her life, from the romantic relationship she’d like to deny with Trevor (Luke James), to her combative relationships with neighbors and strangers alike. At work, Jordan’s the Miranda Priestly of the tech world. Composer Germaine Franco’s DEVIL WEARS PRADA-tinged score, Gordon’s similar staging, and Hall’s physical demeanor provide the visual and auditory references. Her reign of tyranny causes employees to scatter. She’s always decked out in designer duds. And her insane demands drive her long-suffering, pushover assistant April Williams (Issa Rae) to the brink of madness. However, Jordan and her giant ego are in for a reckoning. Marsai Martin in LITTLE. Courtesy of Universal Pictures. 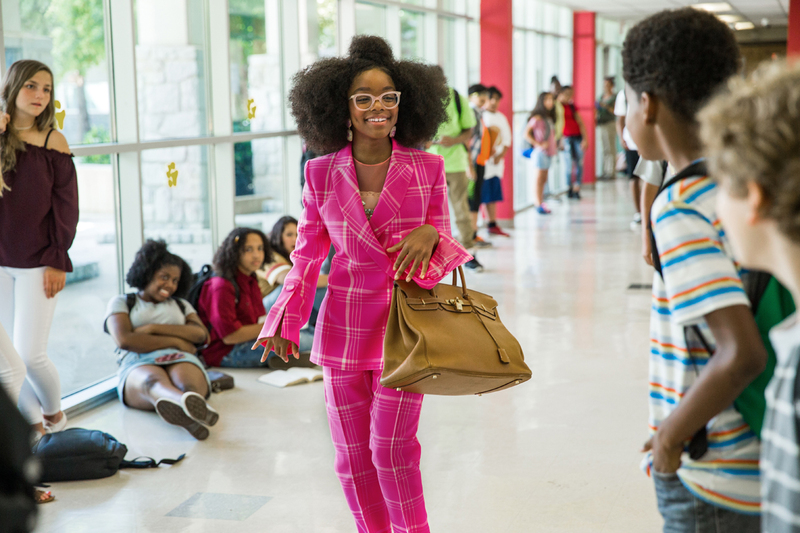 A disgruntled young girl (Marley Taylor) whom Jordan pisses off casts a magic spell on her, transforming her overnight into her thirteen-year-old self (Marsai Martin). Naturally, this occurs at a stressful time as her company’s obnoxious, spoiled investor (Mikey Day) is threatening to pull funding if she doesn’t come up with a new app idea in 48 hours. Not only is Jordan going to have to learn to simmer down, April is going to have to learn to step it up in order to save the company – and her boss. Though LITTLE ticks all the boxes as it tries to emulate all the body-switching movies that came before it (BIG, 13 GOING ON 30, 18 AGAIN!, FREAKY FRIDAY and VICE VERSA), it works overtime awkwardly connecting those pieces together. There’s no bubbly, snappy energy to either of the two protagonist’s quests towards self-acceptance. And when the duo are inevitably bestowed with their breakthroughs, it’s weak catharsis and difficult to buy. April is a cypher and conundrum all rolled into one. Her shrinking violet work personality is at odds with how she’s getting even with her boss behind the scenes. She should be flourishing at work once her boss is out of the picture, but that’s not exactly what happens. It should be fun to see Little Jordan find her way out of this crazy situation, problem solving and experiencing necessary, organic change as she works through past psychological trauma. But she’s beyond reproach for a large majority of the feature – even when she attempts to help a group of outcasts, nicknamed “The Friend Zone” by her middle school peers. We’re expected to have empathy for a bully who’s not given the moments to either learn from her punishment, nor genuinely realize the enormity of her situation. Though the narrative admirably avoids having its heroines change to get a guy, both are given love interests – one of whom the filmmakers apparently had no interest in resolving. April and co-worker crush Preston’s (Tone Bell) relationship is lost on the cutting room floor. 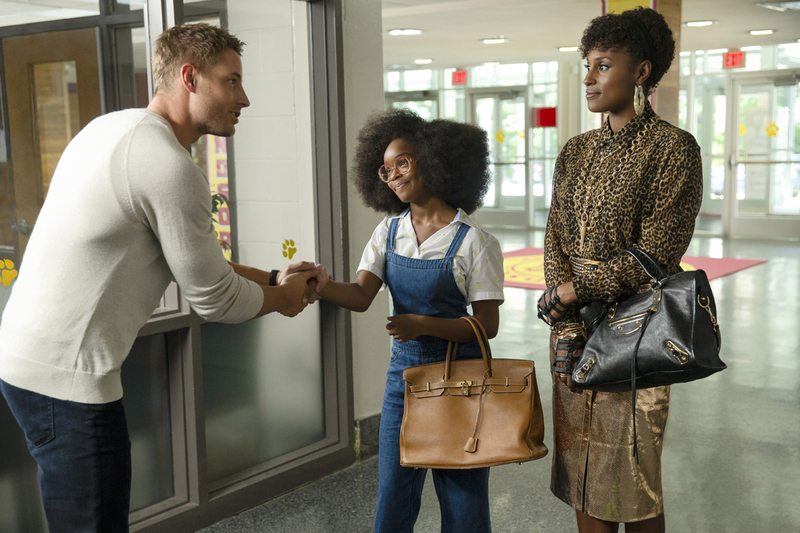 Justin Hartley, Issa Rae and Marsai Martin in LITTLE. Courtesy of Universal Pictures. Sequences that highlight the audacious nature of a grown woman trapped in a child’s body are this film’s lifeblood, yet those scenes are few and far between. When they do appear, like when Little Jordan hits on her teacher (Justin Hartley), or embraces Trevor for far too long, or drunkenly sings Mary J. Blige’s “I’m Going Down” into breadsticks, the inappropriateness is absolutely delightful. Yet the filmmakers can’t sustain this type of energy, and everything else aches for a comedy punch-up. With all this talent assembled in one spot, and good anti-bullying messages and strong sentiments on female empowerment, it’s a shame LITTLE doesn’t have a bigger impact. LITTLE opens on April 12.